“The idea of bands of color, hard-edged, bright color. It was like a breath of fresh air in the early ’60s, because all this messy sh*t, you know, that was going on in New York — we provided an alternative.” Gene Davis oral history transcript, Archives of American Art. With the Smithsonian American Art Museum’s upcoming exhibition, Gene Davis: Hot Beat, the American Art and Portrait Gallery (AA/PG) Library is hosting a complementary exhibition of ephemera showcasing a group known as the Washington Color Painters, or perhaps better recognized by their more dubious title, the Washington Color School. 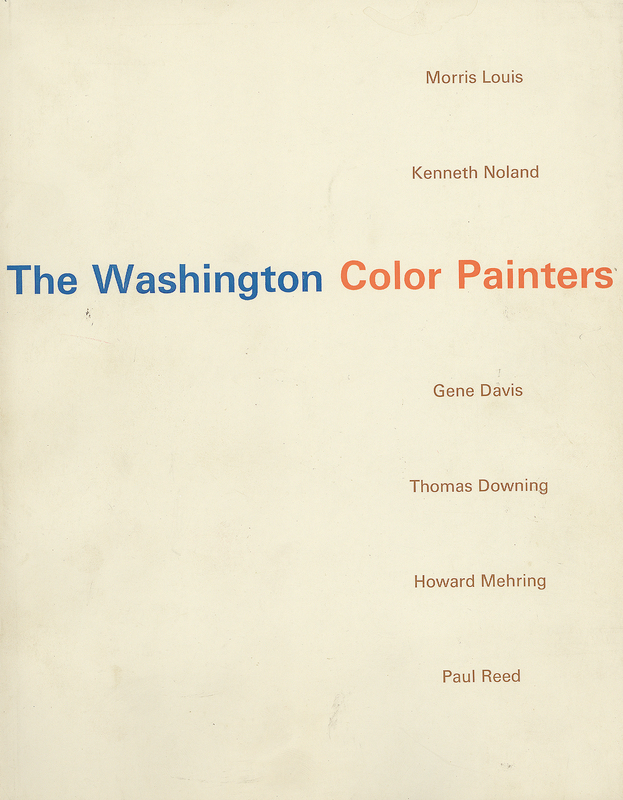 The “so-called school” (as Gene Davis was known to say) was not a school in the traditional sense, but was instead a group of artists working in Washington, D.C. during the 1950s and 1960s who began experimenting with pure color painting consequently putting the capital city on the American art stage. 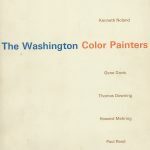 The Washington Color School typically refers to six painters: Morris Louis, Kenneth Noland, Gene Davis, Thomas Downing, Howard Mehring, and Paul Reed. These artists did not actively set out to become a school. In fact, they did not necessarily associate with one another despite being labelled as a group. In 1965 their works were shown altogether in a traveling exhibition organized by curator Gerald Noland at the now defunct Washington Gallery of Modern Art entitled The Washington Color Painters. That same year the Institute of Contemporary Art, also no longer in existence, held the exhibition Art in Washington, which featured the above mentioned six artists in addition to Leon Berkowitz and Sam Gilliam. 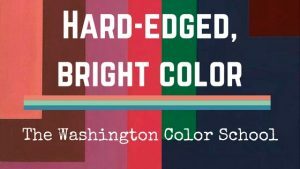 It is unclear precisely when the name ‘Washington Color School’ was first used, however these 1965 exhibitions are the most likely source. Looking back, 1953 was the year the Color School artists were initially becoming interconnected. Kenneth Noland served as the epicenter of the group having become close friends with Morris Louis the year before at the Washington Workshop, arranging a one-man show for Gene Davis and having taught both Thomas Downing and Howard Mehring at Catholic University. 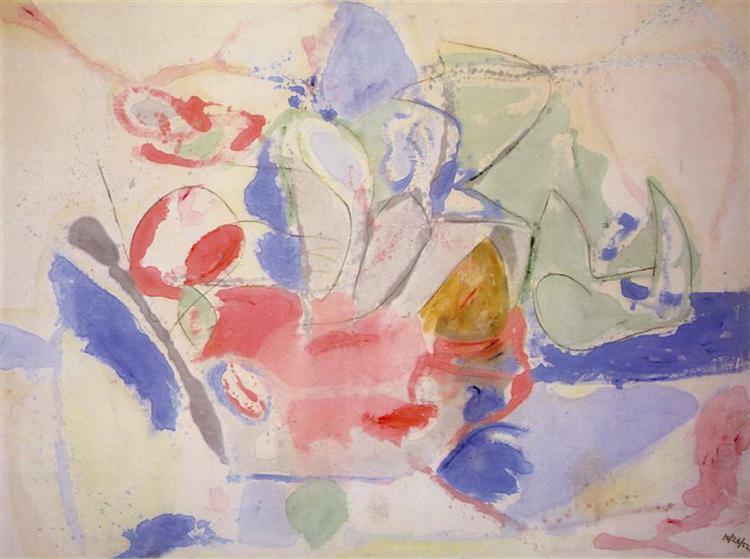 This same year, Noland and Louis took a formative trip to New York City to visit a friend and influential art critic Clement Greenberg at Helen Frankenthaler’s studio. It was here that they saw her abstract work, Mountains and Sea in which the painter used the stain technique, one that Louis and Noland would immediately adopt. 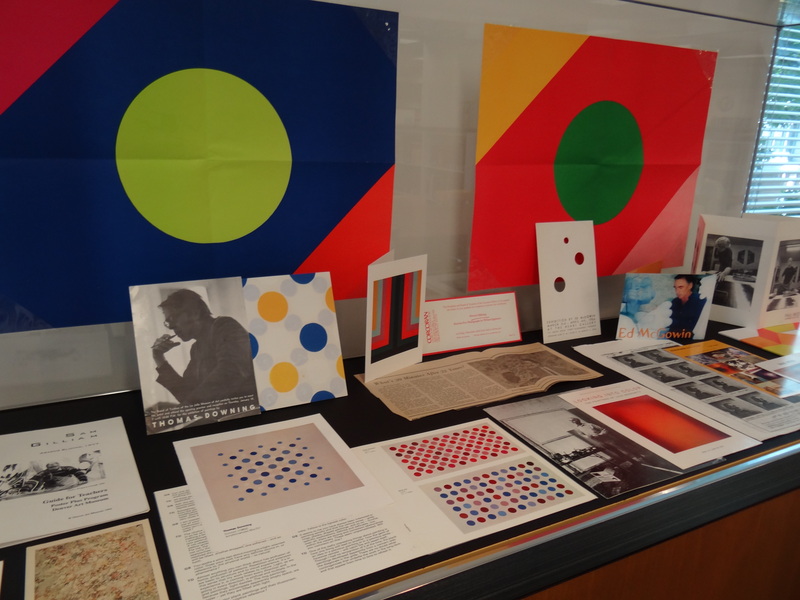 Colorful ephemera related to Thomas Downing, Paul Reed, Howard Mehring and others. Growing out of the abstract expressionist works of Jackson Pollock, Barnett Newman and Mark Rothko, this group of artists looked to color for expressive purposes without any overarching pictorial program. The materials—and the technique—were the message. These painters were more interested in what was happening on the canvas through the application of color in a variety of methods—staining, pouring, dripping, dabbing—than in exact representation. 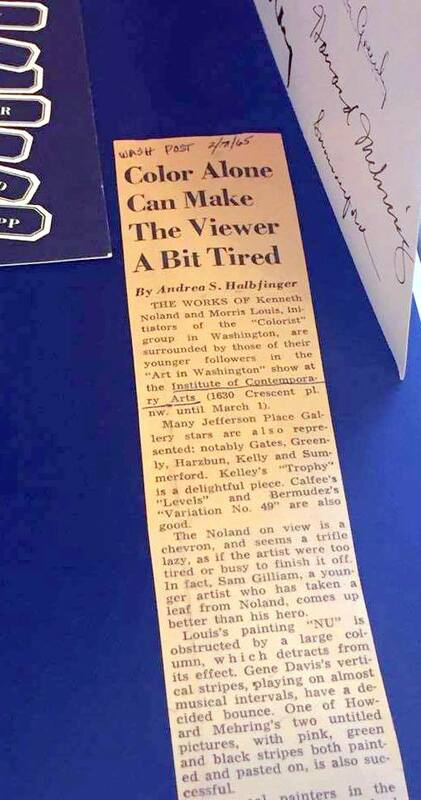 1965 Washington Post review of ‘Art in Washington’ by Andrea Halbfinger, noting the color was tiresome. This was known as Color Field painting in which large unprimed canvases were arranged with color in large, abstract fields meant to engage and envelope the viewer. 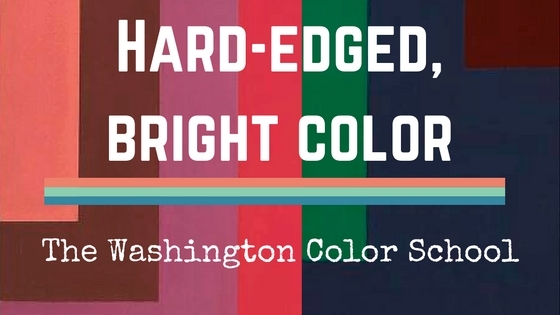 This exhibit also explores the works of some of the contemporaries of the Washington Color School, those likewise associated with the Color Field style. Other artists represented include Leon Berkowitz, Sam Gilliam, V.V. Rankine, Alma Thomas, Hilda Thorpe and Anne Truitt. Exhibition installation featuring an entertaining ranking of artists by Donald Corrigan. Much of the exhibition material for “Hard-edged, bright color” is drawn from the Art and Artists Files collection at the AA/PG Library, including the newly acquired Corcoran artist vertical files. 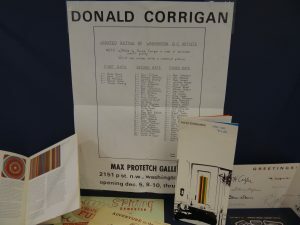 The Library contains files on all of the Washington Color artists as well as corporate files on many of the institutions that played a key role in their successes such as the Washington Workshop, the Jefferson Place Gallery, and the Corcoran Gallery of Art. The exhibition will remain on display until spring 2017 in the reading room of the Smithsonian AA/PG Library. You can view the exhibit any time between 10am-5pm in the Victor Building Suite 2100, located at 750 9th Street NW, Washington, DC. HARD-EDGED, BRIGHT COLOR: PURE COLOR. Cohen, Jean. Informal interview by Angelique Roy. Smithsonian AA/PG Library, 29 Sept 2016.